The Dakota Rail Regional Trail covers a portion of the 44-mile Dakota Rail corridor, which crosses Hennepin, Carver, and McLeod counties. The trail is a popular recreational amenity in both Mayer and New Germany. 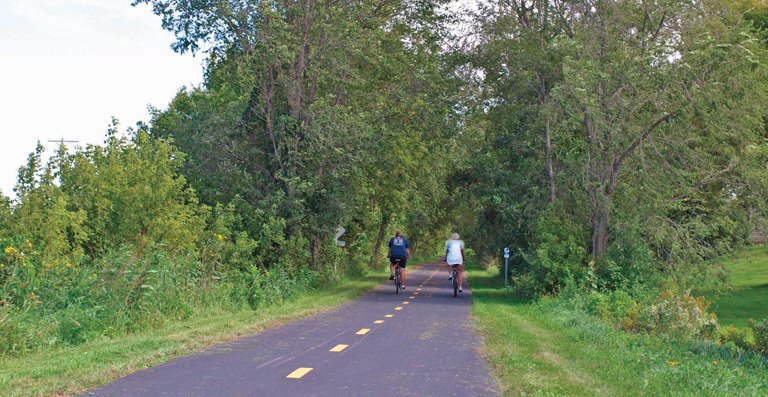 The first phase of the trail in Carver County, from the Hennepin County border to Mayer, was completed in 2010. In 2012, the remaining 5.5 miles of the Carver County portion of the trail was completed, extending it from Mayer through New Germany to the McLeod County line, and culminating in 12.5 miles of paved trail. A crowd of trail enthusiasts gathered in Lester Prairie in September 2015, celebrating the opening of the first portion of the trail in McLeod County. Previously, the trail had been paved from Wayzata through Hennepin County, and across Carver County to the McLeod County border. Now, trail users can travel as far west as Lester Prairie on the trail. In 2015, the Lester Prairie Trail Committee solicited donations to develop the trail from the Carver County border west to Pine Street in Lester Prairie. The portion of the trail in McLeod County has a packed gravel surface, while the trail in Carver and Hennepin counties is paved. In 2017, McLeod County accepted a Legacy Grant to fund paving of the trail from the end of the pavement at the Carver County border to McLeod County Road 1 on the west side of Lester Prairie. Work on the project began in summer 2018, with substantial completion expected in fall 2018. The Dakota Rail Regional Trail provides recreation for citizens of all ages. The trail passes through a variety of scenic areas, including wetlands, wooded areas, and agricultural lands. The paved portions of the trail accommodate the planned uses of walking, hiking, biking, jogging, dog walking, inline skating, and rollerblading. Motorized vehicles are not permitted on the trail.